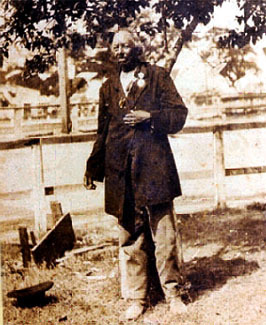 Jack Amos was born about 1830, a Choctaw Indian, and applied for tribal membership with the Dawes Commission in 1901. He filed a deposition which provides a great deal of information about his family. He lists his parents at full-blood Choctaw, his father as Apa-tom-by and his mother as Nah-ha-tema. Jack is the grandson of Nahotima, a sister of Chief Pushmataha. Jack’s Indian name was E-aht-onte-ube meaning “Going Out There to Kill,” a name he may have earned during the Civil War. Native names sometimes change during the lifetime of the person, depending on circumstances. He fought with the 1st Choctaw Battalion under Major J.W. Pearce for the Confederacy. After the Civil War, he lived on and worked the farm of Evan Shelby Gilbert on Tallahatta Creek. The Dawes Commission awarded Jack land in Indian Territory, but Jack, by then quite elderly, refused to leave Mississippi. Jack died in 1906 at about the age of 76. You can read more about Jack and his Native American ancestors at this link. Hat tip to Jennifer for info about Jack Amos. This entry was posted in Choctaw. Bookmark the permalink.